Oats. That’s right. And it’s not just for your grandparents or your kid cousin. 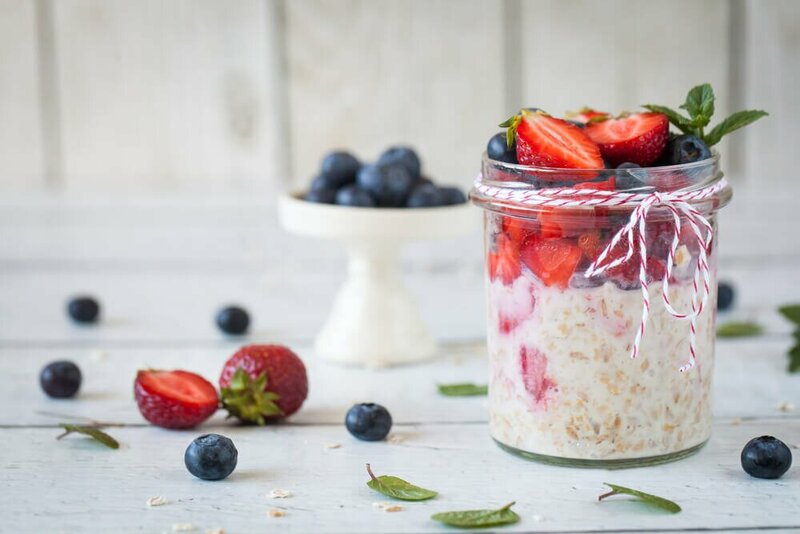 Making a healthy breakfast doesn’t get any easier than making yourself some overnight oats. While oats in any form are pretty good in itself, overnight oats have some extra magical powers. All you have to do are soak these oats overnight so that they absorb the liquid they were placed in and voila! You’ve got yourself a good wholesome meal to start the day. In fact, unlike grains, barley and rye, oats are gluten-free so this is perfect for those who have celiac disease. Overnight oats are known as a no-cook method of making oatmeal. Instead of waiting for long periods to cook your oats over the stove with liquid, or even in the microwave, you mix rolled oats (traditional, old-timey style oats) with liquid and other mix-ins, and then let it rest in the fridge overnight. It’s so easy, even a five-year-old (under the right amount of supervision of course) can do it! You can easily whip up overnight oats in just a regular bowl or a food storage container with a lid. Jars are usually the go to for most of these recipes. While there are an unlimited amount of recipes out there to try, some of which incorporate chocolate, bananas, berries, even kale (if that’s what you’re into!) but let’s stick to the basics. Try out this really easy to make overnight oats recipe. The most common mixture is in equal parts raw rolled oats, milk and yogurt (I like 1/3 or 1/2 cup of each). Use any kind of yogurt or milk. Put in the fridge overnight (uncovered or covered) and let them soak up the liquids. If you want any toppings, as mentioned earlier, the sky is the limit! Strawberries, blueberries or even cut up apples are great toppings to go with. You can even go ahead and use some muesli to add more crunch to the first meal of your day. Here’s the low-down on the gluten-free magic! Stir everything together in a bowl. Then place into the fridge overnight. When the morning rolls in, you can top it up with something crunchy and something with healthy fats – like nut butter or nuts. Here’s another alternative to the given recipe. OATS OPTION 2: This one incorporates carrots in the mix! To a canning jar, add shredded carrot, oats, maple syrup, shredded coconut, yogurt, cinnamon, and almond milk. Combine. Preparing overnight oats is one of the easiest ways to really start your day healthily and keep you energized for the best part of it. This pudding-esque breakfast is both equally scrumptious and time-saving. But don’t just take my word for it, try it out!